Communication in the digital world is constantly evolving. And in the race to stay ahead, it can be easy for marketers to forget about good old fashioned print collateral. Just in time, then, comes this survey from Valassis (part of its 6th Annual RedPlum Purse String Survey), which proves that the temptation among marketers to throw the print baby out with the inky bathwater is somewhat misguided. 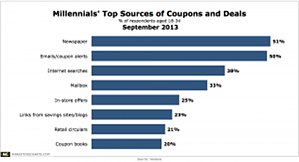 Millennials, it turns out, get most of their coupons and deals from newspapers! The piece goes on to clarify that Millennials are, of course, “more likely than the general population to be turning to digital methods to obtain deals and coupons.” But the fact that the most technologically savvy generation has found something reliable in print, speaks volumes to the medium’s staying power. Given this insight, it would be foolhardy for marketers to leave print ads behind in the mad dash for the trendiest new methods of communication. If only because no one medium is going to be as reliable as a diverse mix of channels. And the hippest advertising channel of all, it would seem, is still black and white and read all over.